George Farmer sets up a Far East themed low maintenance planted aquarium that doesnâ€™t cost the earth. Perhaps the two biggest misconceptions about planted aquariums are that much money needs to be spent on specialist equipment and considerable time on maintenance. However, you can achieve a great-looking planted aquascape without breaking the bank and this set-up is designed with low cost and low maintenance in mind. Low lighting and low nutrient levels are used and plants can be grown in these conditions. Java fern, various Cryptocoryne and hairgrass all grow well in low to medium lighting. CO2 injection is not necessary and I substituted this with a liquid carbon fertiliser to give the plants improved growth and help minimise algae. As the plants are slow growers, minimal time is spent pruning them. Setting up and running cost is also minimised because I don’t need many fertilisers or use lots of energy for lighting. I have used collected wood pre-soaked and cleaned to ensure no nasties. Some old substrate from a previous set-up has been used as a base layer under inexpensive inert fine gravel. The base contains beneficial bacteria and nutrients that will help quickly mature the new aquarium, helping to prevent early algae issues. All the plants have been taken from old aquascapes and donated from friends’ tanks. Even the rocks were found in an old box in the garage! The plants all originate from South-East Asia, except for the universal Eleocharis acicularis. Microsorum pteropus 'narrow' creates an ideal focal point positioned using the golden ratio concept. This is set off-centre by around a third and provides better aesthetic balance than being dead centre. Various Cryptocoryne are planted among the rocks and wood to add texture. The fine texture of Eleocharis (hairgrass) complements the java fern and crypts. The wood is positioned to draw the eye across the aquascape, tying all the components together. Fish were chosen for size, colour and behaviour. Checkered barbs (Puntius oligolepis) were ideal as they remain quite small at 5cm/2” and have subtle yet beautiful coloration that differs between sexes. Their relatively tall bodies suit the aquarium’s dimensions. Zebra loach (Botia striata) are among my favourite fish and thrive in planted aquaria in groups of at least five. Ten barbs and five loaches make for a low stocking level, helping to ensure water quality remains tip-top without needing lots of water changes. Their coloration perfectly suits the aquascape too, helping to enhance the overall natural appearance. My 80 x 45 x 45cm aquarium holds around 160 l/36 gal. It has good height and depth and holds enough water to house a good quantity of small to medium-size fish. It is lit by two 25w T8 fluorescent tubes that provide enough light for most plants. There’s no background as the pale wall behind creates a nice effect when the lights are on. A base layer of substrate is added. It consists of a mixture of used Tropica plant substrate mixed with fine inert gravel. Because it has only recently been used from an existing aquascape, it is rich in beneficial bacteria and nutrients to help establish the aquarium and feed plant roots. The old substrate is placed in the area where most plants will be sited. The base layer is topped with around 12Kg of Unipac Fiji Sand. Its fine grain ensures root penetration isn’t blocked and planting of delicate plants with fine roots like Eleocharis is made easier. The natural colours go well with the intended wood, rock and plant layout. The sand is also sloped to the left and rear to add a sense of depth. The first wood is added. This is an old piece I had lying about in my garage and it was pre-soaked and cleaned prior to positioning.The wood is sited carefully, with consideration given to the angles of the branches. The solid base of the wood is positioned in the corner to act as a foundation for the other pieces of wood. More wood is added with two rocks on top to prevent it floating. The rocks contain limestone, so water changes will prevent the hardness and pH rising too much: 30% weekly being ample. The wood may leach tannins if not pre-soaked. This is not an issue for fish and plants, but, if preferring clear water, changes and/or activated carbon filtration will help. Extra wood is now being added to the aquascape and carefully positioned in a natural-looking manner as the view builds to completion. I have imagined it all coming from the foundation piece of wood, as I talked about in Step 4. The smaller pieces are prone to floating, so are wedged between the existing wood and rocks to keep them secure. The last rocks are positioned around the base of the wood. I have partially buried the stones to give the illusion of being there for many years. Some time is taken to position both wood and rocks. I’ll move it around, take a few steps back to analyse the composition – then move around again. I repeat this process until I am happy. The tank is filled, planted and equipment fitted. Because the plants are from elsewhere less time is needed to prepare them. I remove leaves with algae and prune roots to 1cm/ 0.5”. Each plant is planted using tweezers. The fern is a focal point and crypts planted around rocks and wood. Hairgrass is in the open areas. The tank is then fishlessly cycled. Feed fish three times with frozen and dry foods. Add 3ml of liquid fertilisers. Tank: 80 x 45 x 45cm/32 x 18 x 18” and cabinet (£200). Lighting: Two 25w T8 fluorescent, (£40). 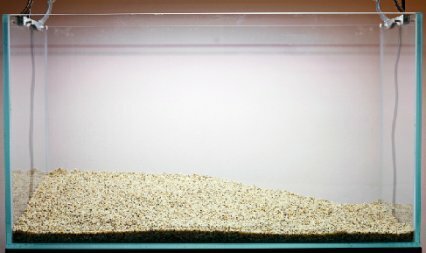 Substrate: Old substrate and new Unipac Fiji Sand, (£10). Fertilisers: All-in-one liquid, liquid carbon, (£20). Plants and décor: Re-used plants, collected décor, (free). Fish: Ten Checkered barbs, five Zebra loach, (£30). Crypts do best in nutrient-rich substrate. However, they can be grown in plain gravel or sand, providing enough nutrients are made available to the plant leaves by dosing regularly with a good quality comprehensive liquid fertiliser. Root tabs will promote further growth. Water parameters: pH 6-8, soft to hard water, 20-25°C/68-77°F. Diet: Feed a variety of quality frozen and dry foods. Notes: Easy to breed egg scatterer. Colours up best in a densely planted tank. Adult size: Up to 9cm/4." Water parameters: Ideally soft and acidic, 23-27°C/73-81°F. Diet: Quality sinking pellets and mix of frozen foods. Notes: This is a prolific pest snail hunter, but should not be bought for that purpose alone. It’s best in groups of five or more. There are no confirmed reports of home breeding. Java fern does best when attached to décor, such as wood or rocks. Its rhizome needs to be exposed to the water column where water can flow over it. Tying ferns on with cotton can be tricky, so try using small cable ties. Once the fern has established they can be cut off. Join an Internet forum and become an active member, so you can learn and share information with like-minded enthusiasts. You could swap, give and receive spare plants when they become available. When planting Eleocharis (Hairgrass) split the pot into as many individual plantlets as possible. Each should consist of just a few ‘hairs’. One pot can give as many as 50-plus plantlets, depending on size of pot. This will give you better coverage and quicker carpeting time. Trim tips off ends of the plants to accelerate growth and net cuttings after they have floated.